I used allen bolts on my last motor build to. Makes a person wonder why I have been fighting those philips head screws all these years. Ya, I'm with you on that. I just wanna be able to weld on tabs and stuff as well. Hardtailing is for someone with far more skill than me. I saw on the news yesterday morning about extraordinary amount of snow and the rough winter you guys are having. They showed pictures of houses with snow up to the roof. Is it that bad where you are? I know you were talking about rain last weekend. I just ordered a set of stainless socket heads for my 450 also. 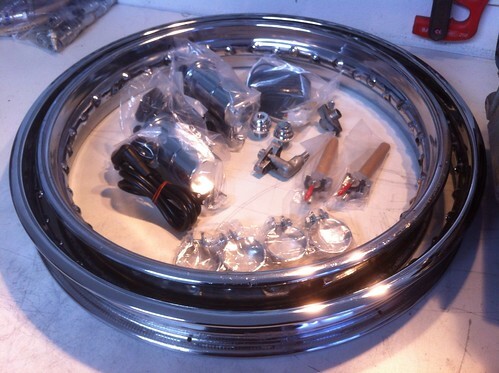 There' some guy on Ebay selling polished sets all the time for a little over $20. We'll see what they look like. I think a real good place for them is on the float bowls for carbs too. Much easier when you're messing with jets. The set I got was from ebay also. Look pretty good in my opinion. They came individually packaged for each cover, made it easy to figure where they went. i got a set from ebay the guy had a good list of were the certain sizes went and if you need to cut the length, nicely polished stainless steel covered every bolt on engine including the ones under the breather cover. Now that's a good friend to have! A lot of really nice stuff going on there. Yeah I have like 8 of those. I love them for keeping things in place and square at the same time. I have a smaller MIG as well. I would have no problem welding up a hardtail with it. MIG is just as strong as TIG, but the problem with MIG is that you can get a nice looking weld that has no penetration. I've done a lot of welding with mine though and am very comfortable with it. Now if you want a TIG welded frame for the small pretty welds, I can't blame you for that. Nice TIG welds sure are pretty! My bike is welded with a MIG. Its all I have. My dad had me welding since I was about 12 so I am comfortable with my welds. I have no problem trusting a MIG welded frame, that being said if I had a TIG I would use it. Tubing is easily in the capability of MIG welding. Yeah, definitely not questioning the power of the welder. It's my own skill that's in question. Those TIG welds sure are pretty too. I don't know if it's my Harbor Freight mask or my aging eyes, but I have a tough time seeing the weld as I'm making it sometimes. Not to get too off topic here, but have you replaced the plastic lens protectors on your helmet lately? I replace them every now and then even when they don't look too bad and it always helps. thanks for the tip on polishing with the brass wheels tried it today on an old xs 650 case works great going to use it on my k2 to polish fork tubes and top clamp. Do you wear reading glasses at all? if your in your 40's and you don't, maybe you should try them. Start with +1.50 you can get them real cheap, about $2.00 at any dollar store, and they last just as long as the $20 ones from wal-mart. I didn't need them till I was 42, but wow! what a difference. Your welds will look %100 better. NP man. It's not like chrome finish, but it gets that old but well kept look, kinda. Got a package today. Feels like Christmas came early this year! The man himself sent it, Tommy Summers. All top quality parts. Now I'll get my wheels laced up and tires put on. Soon this puppy will be a roller! +1 on the brass wheels. My son and I have been using them also. They work great! Nice. I love getting packages in the mail! What all did you get? 2 rims 18" and 21"
As soon as I get my frame back from welding I'll be starting mock up. Ah nice.. The chrome coils and the regulator were the only things I couldn't id in the picture. Now that I know what they are, it seems obvious. I'm looking forward to seeing some mock-up pictures!